Louisiana’s hot and humid climate makes the state an ideal home for all kinds of insect pests. Surprisingly, some insect pests in the state are partly beneficial to residents, as they kill other insect pests. While most insect pests within the state do not provide this free pest control service, but the bald-faced hornet happens to be one insect that is both dangerous and beneficial due to its habit of preying on other dangerous wasp species. Despite being called a “hornet” the bald-faced hornet, and all other hornets, are actually just a particular group of wasps. The same is true for “yellow jackets,” as all yellow jacket insects are wasps. In fact, some wasps are considered both yellow jackets and hornets, and this is the case with the bald-faced hornet. The bald-faced hornet is related to the yellow jacket, and they are often categorized as such, but they are not “true” hornets, as their bodies are stout and lightly colored. These hornets are considered by experts to be beneficial due to their habit of hunting flies and other yellow jackets. However, experts are also quick to point out that bald-faced hornets are also extremely aggressive, and there have been reports of this species attacking people without provocation. Adult bald-faced hornets capture and chew flies to pieces before feeding them to their larvae. These hornets can be found in just about every location of Louisiana including forests, backyards, meadows, gardens and urban areas. These hornets are, like most hornets, extremely aggressive and they will not hesitate to attack when they perceive a threat or when their nest becomes disturbed. Although bald-faced hornets can be found in most US states, they are particularly numerous in Louisiana, as the subtropical climate in the state allows these hornets to easily overwinter by hiding away within hollow logs and plant matter. This wasp species’ nest resembles a grey football and they are often found attached to tree branches, shrubs and the corners of a building’s exterior. If a nest is spotted, a pest control professional should be contacted for its removal in order to prevent attacks. Have you ever sustained a sting from a hornet? When it comes to wasp attacks, most people assume that only those with allergies to insect venom are at risk of dying from such attacks. This is a reasonable assumption, but quite inaccurate as well. While most wasp attack fatalities resulted from severe allergic reactions, a minority of wasp attack fatalities result from an overdose of toxic venom. However, health care professionals know that odd physiological responses can sometimes occur in people who have sustained insect bites or stings, and wasp stings are no exception. As it turns out, in rare cases, victims of wasp attacks who sustain numerous stings can experience bizarre and unpleasant neurological symptoms and they can even develop neurological conditions that sometimes result in brain tissue death, brain and spinal cord swelling and nerve damage. Not long ago, a 45 year old man sustained 50 stings from wasps while he was mowing his lawn. The man drifted in and out of consciousness while being taken to the hospital. Once the man’s vitals stabilized, he appeared to be in good spirits, but he suddenly began alternating between complete unconsciousness and alert conscious states. The man was also unable to speak for periods of time, and while in an unconscious state, he stared blankly with dilated pupils. The man would fall into an unconscious state every two to three hours, and upon waking, he would lose all memory of being in the hospital. With steroid therapy, the man’s neurological symptoms disappeared within a matter of months. Although rare, some people who have been injected with high amounts of toxic venom during wasp attacks have developed neurological complications as a result. These attack victims have developed eye disorders, weakness in skeletal and respiratory muscles, brain and spinal inflammation, development of necrotic brain tissue, nerve damage, cerebral bleeding, oxygen impediments to the brain and more in response to sustaining numerous wasp stings. In most cases, normal neurological functioning is restored in these individuals, but some have gone on to suffer lasting neurological deficits after wasp attacks. There are several theories concerning how wasp stings could induce such unusual neurological symptoms, but the ultimate cause of such symptoms remains unknown. Do you think that these neurological symptoms occur in response to unusually high doses of wasp venom? What is the fiercest type of insect that you can think of? Scorpions, certain spiders, or maybe certain centipedes? Well, none of those three animals belong to the insect community, as scorpions and spiders belong to the arachnid class, and centipedes belong to the chilopoda class. When it comes to insects, naming an intimidating species can be surprisingly hard. Of course, there are many insects that are considered dangerous, such as mosquitoes and other disease spreading insects. And there is certainly no shortage of insects that are commonly perceived as frightening to humans, such as cockroaches. Insects that are annoying, such as biting or buzzing insects, can be named all day, but which insect species can rightfully be called intimidating? Well, there are flying insects that sting, of course. There is good reason to become intimidated by flying insects that sting, as every year numerous fatalities result from bee and wasp attacks. Although bees are well known for stinging people, most species will not sting unless they feel threatened. Bees can only sting a person or animal once before losing their stinger forever, and many species die in response to having lost their stinger. Many people can agree that wasps pose a particularly intimidating threat to humankind, especially as far as insects are concerned. In fact, wasps are so well associated with malevolent behavior toward humans, that most people would never believe that a human-friendly wasp species even exists in nature. However, a group of wasps known as sand wasps are not at all a danger to humans. In fact, these wasps are gentle enough to eat flies right out of a person’s hand. There exists many different species of sand wasp, the largest of which is the Bembix americanan spinolas. These wasps are known for hovering close to humans. Understandably, this intimidates people, as these wasps are not only large, but they also possess black and yellow stripes that closely resemble the notoriously mean spirited yellowjacket wasps. However, this sand wasp species only hovers close to people because this is exactly where it can catch delicious flies, as flies often hover around humans. Needless to say, it can come as a shock to witness a wasps eating flies directly out of a human’s hand. Do you believe that wasps, as a species, are unfairly perceived as being inherently dangerous to humankind? Stumbling upon a wasp nest can be frightening, especially if it is still active. Wasps are well known for being much more aggressive than the vast majority of bee species, and many of them will sting victims repeatedly. There are numerous wasp species that build nests of different types. Some wasp nests are located high up in trees on branches. While other wasp nests are located beneath the ground, like yellowjacket wasp nests. Yellowjackets are particularly frightening as thousands of them can swarm a person within seconds by flooding out of their underground nests. Very few yellowjacket attack victims anticipate their attacks since their nests are not easily detected. It goes without saying that wasp nests should always be removed by a professional pest control officer. However, sometimes even the most seasoned professionals can become terrified of the active wasp nests that they are called upon to remove. For example, several months ago a pest control professional in Louisiana removed a wasp nest that was as large as a refrigerator from a family’s home. The entire removal took forty five minutes and it was recorded on a GoPro. The footage can now be viewed on YouTube. Not long ago an experienced pest control professional named Jude Verret was called to a residence in Patterson, Louisiana in order to remove an enormous nest that contained millions of European yellowjacket wasps. Verret was dressed in a beekeeper’s outfit and armed with a shovel to hack the refrigerator-sized nest out of the shed. Once Verret entered the shed, his GoPro footage captured the flurry of yellowjackets that were aggressively dive bombing everything in sight. Verret has been removing the nests of dangerous insects from people’s property for over twelve years, but this nest is one of the largest that he had ever seen. Typically, when Verret removes an insect nest he can expect to get stung a few times, despite his protective gear. Amazingly Verret did not sustain any yellowjacket stings while removing the colossal nest. Did you ever play with insect nests that you found as a child? Have you ever encountered an active wasp nest? By now, most people have become aware of the fact that the number of bees in the world has been decreasing steadily for more than a decade. Experts are calling this global decrease in bee life “colony collapse disorder.” CCD is caused by several factors, such as habitat loss and disease, but recently researchers found yet another threat to bees–Asian hornets. The Asian hornet should not to be confused with the Japanese giant hornet, which is a highly aggressive and venomous wasp species that has caused several human deaths in Europe over the past fifteen years. Asian hornets, on the other hand, are not any more harmful to humans than native wasp species in Europe, but they have been feeding on Europe’s native honey bees for several years. One single Asian hornet can kill as many as 50 honey bees per day. Naturally, the Asian hornet’s uninvited presence in Europe is of serious concern to beekeepers on the continent. The invasive Asian hornet presence in Europe has been growing steadily since it was introduced back in 2004. As a result of its years of killing the economically important European honey bee species, Asian hornets have been targeted for extermination by everyday Joes living in the United Kingdom. The British citizens are hoping to save the native honey bees in their country by doing their part to destroy Asian hornet nests wherever they are found. Unfortunately, these citizens have been killing native hornets after mistaking them for Asian hornets. According to a British wildlife charity known as Devon Wildlife Trust, British citizens are doing more harm than good with their attempts to kill invasive Asian hornets. The charity’s spokesperson, David Hussey, claims that some people call in asking if it is okay to kill the “Asian hornet” nests that they find, while others call in to claim that they had already destroyed “Asian hornet” nests. 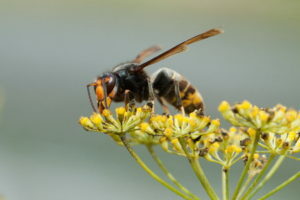 However, after visiting these locations, officials with the charity learned that every one of these citizens actually destroyed native European hornets (Vespa crabro) as opposed to invasive Asian hornets (Vespa velutina). The inadvertent killing off of native hornets will only contribute to the current loss of hornets that are native to Europe. Native European hornets are major players in the region’s ecosystem and they help to keep insect and spider pests at bay. Ever since 1987, killing native hornets has been illegal in Germany due to the dramatic decrease in their population. Unintended consequences like this is why insect pest eradication should best be left to experts.